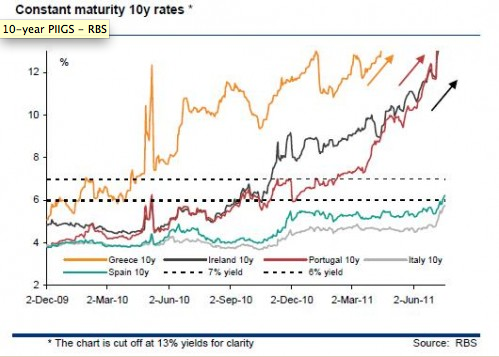 Spain has entered the danger zone for yield levels. 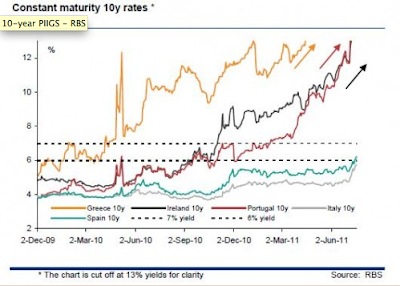 The chart [above] shows the yield moves in the constant maturity 10y paper for the GIIPS countries. These markets traded a range between 6 per cent and 7 per cent but ultimately this proved to be a pause before the move to higher yields then accelerated. There is no consistent yield trigger level inside this range but market talk of point-of-no-return around the 6 ½% is not without foundation either. I was somewhat skeptical of that outcome a month ago, but the latest data certainly give cause for concern. If the bond markets do lose confidence in the ability of Italy and Spain to service their debt, that can quickly become a self-fulfilling prophecy. In turn, it's hard to see how that doesn't lead to a full-fledged existential crisis for the euro, which I think has to cause a contraction in the real European economy, and probably the global economy (although the latter would be somewhat mitigated by the reduction in commodity prices due to reduced European demand). Update: I had some thoughts on the general nature of these kinds of confidence loss events here. But supposedly we're better prepared today. Of course, supposedly derivatives made the system more robust, we could trust the ratings agencies, and housing never crashes. Stuart's graph ends at 13%. The RBS Analysts are not fools. They were sounding the alarm in 2008 much more loudly that other institutions at the time. It is interesting to read the comments on articles in the 2007-mid 2008 timeframe. RBS got burnt very badly too of course, I suppose their traders and CEO were more fond of gambling than listening to their analysts.